Micro controller based User friendly HMI. In house Developed Electric Hardware. Feeding mechanism through Servo motor, which enables high speed along with excellent accuracy. No’s of pouches produced – count batch wise/day wise. WE HAVE DIFFERENT MODELS FOR DIFFERENT PRODUCTION REQUIREMENT, LOW, MODERATE AND HIGH PRODUCTION CAPACITY. We manufacture, supply and export a vast gamut of grains packaging machine, powder packaging machine, snacks packaging machine. Our manufacturing range starts with our machine small ffs machine, granules packing machine, vertical ffs, automatic tablet counting machine, object counting & filling machine, semi automatic weigh filler, automatic form fill & seal machine with cup filler, auger filler & multihead weigher. 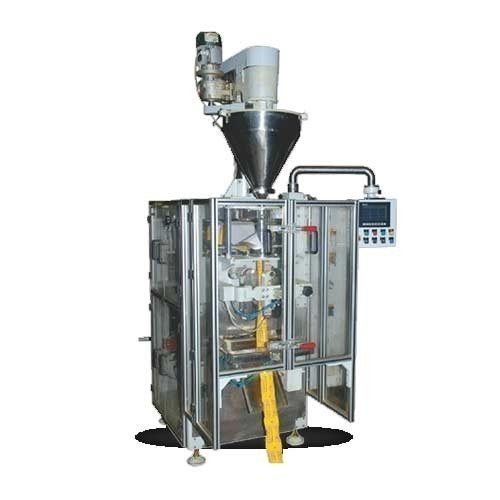 It includes machine of rice packing, sugar packing, tea powder packing, powder packing, spices packing, dry fruits packing, liquid packing, oil packing, detergent powder packing, farsan packing, chivada packing, wafer packing.candy packing. we have machines for packing vermicilli & similar food products. Besides this, we have machines for packing Tablets (pharmaceuticals) and engineering products such as Nuts, Bolts, Lugs. This can either be done by "count" or "weight". The count is calculated by actually counting each item using state of the art Electrical sensor.